Now you can bench Emma. Really? If you didn’t get Emma in Spec Ops 2., now you can buy a piece of the sky pie and leave your regrets behind. Maybe. 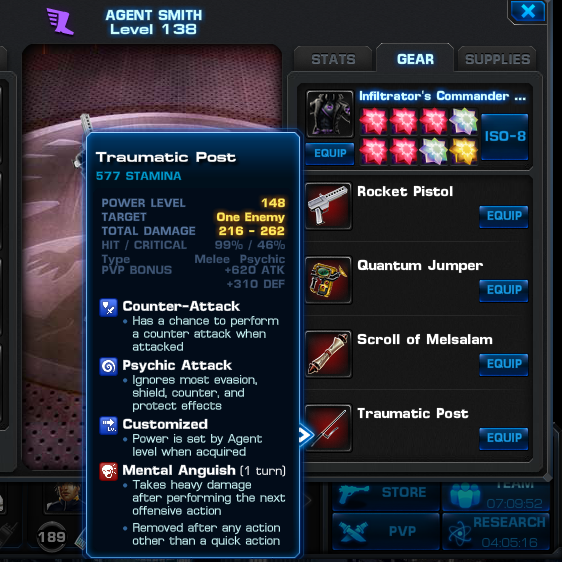 Beyond the nice play on words – post and trauma, players are rightfully concerned that if Mental Anguish does Mental Scarring, this is one of the worst limited edition offers for P-D to push out via the store. Unlike Emma, the Traumatic Post’s version of Mental Anguish does not penetrate the Force Cage. Though it does reach beyond Captain America’s Shield Guard. Considering that the damage of the Traumatic Post is underwhelming – the Traumatic Post should lay out a Migraine with the Mental Anguish. Unless P-D adds Migraine (or Blindness – think brilliance) to the Traumatic Post, the Hero School must valuate the Traumatic Post at 12 Gold. No more and, quite possible, much less. The white, Future Foundation uniforms are cause for much brow-brau lifting. Now Spidey has one too. He’s ready to join the striking yet ambiguous sexual orientations of the future. Or Berlin’s red light district. Whichever excites you the most. Makes you wonder about the office parties at Playdom-Disney. Don’t it?! If Stan Lee is hanging with Woody Allen, everything kinda makes sense. Is it worth 66 cp? After team up with Spiderman, Gambit threatened to quit SHIELD due to his alleged “discomfort” with tingling sensations. “It just ain’t right or funny!” Gambit was quoted saying to Nick Fury. Going from the black suit to the white suit is a big let down. That’s what Peter Parker reportedly said. 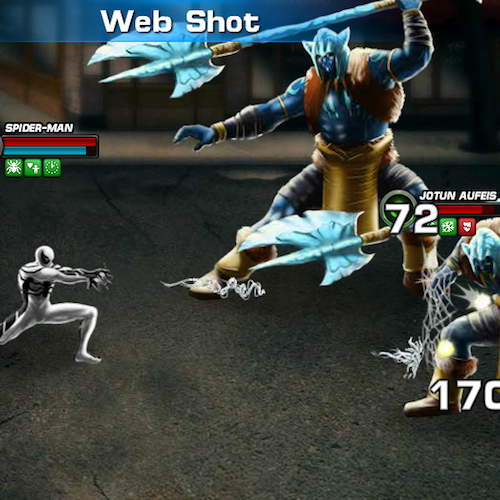 In fact, SHIELD research shows a dramatic drop in damage output since Spidey got the tingles. If P-D added Dizzy or Slowed as a passive add-on to some of Spiderman’s attacks (hey now – Spidey can strut and pole dance with the best of ’em), the “Bitte, baby” uniform would make sense. Or if a team had five heros – not just three. Unless P-D adds Dizzy or Slowed as a passive improvement of Spidey”s feeble attacks, the Hero School must valuate Spiderman’s Future Foundation uniform at 48 cp. No more and, quite possible, much less. Monster trucks, gumbo, and Gambit go together like Apple Pie a la mode with a slice of processed, cheddary-like cheese melted over top. All of which may explain why Gambit makes some monumentally huge bad decisions. Or not. Beyond Remy’s lack of common sense and abstract logic, it must be said that Gambit is a beast. Is Gambit worth 90 cp? Honestly, leveling Gambit up to 12 has not been an exasperating chore. It’s even been fun at times. 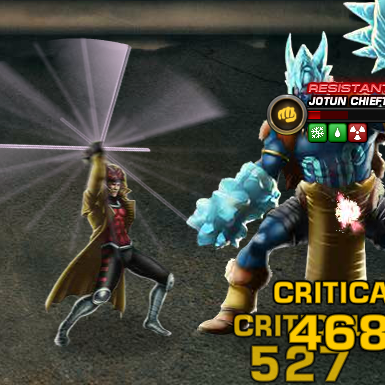 Assuming Playdom-Disney does not nerf Gambit like they did to Emma, Black Panther, and others AND they make it so that Royal Flush does, infact, debuff the targets, Gambit is worth every cp in the 90 cp price tag. However, player be warned. P-D tends to nerf new heroes within days to weeks of release. This entry was posted on Friday, August 31st, 2012 at 12:03 pm and is filed under Games. You can follow any responses to this entry through the RSS 2.0 feed. You can leave a response, or trackback from your own site. I must spent 64 gold to get Traumatic Post….